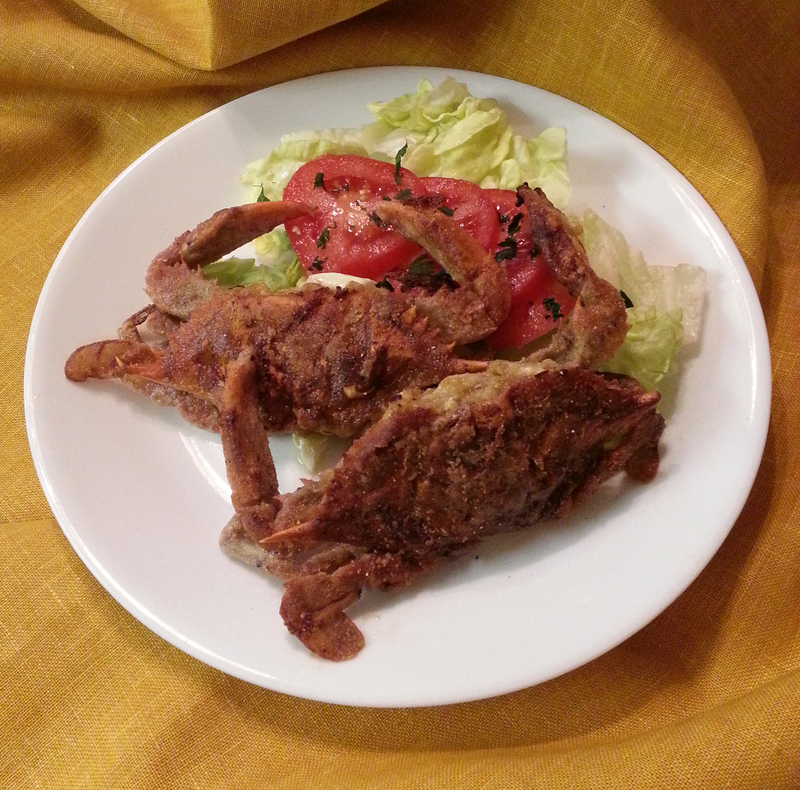 Pan Fried Soft Shell Crab – Soft shell crab season has been very short this year. Shorter than usual. And soft shell crab is a food you eat while in season. For years, it has been a delicacy we all look forward to during the month of June. This year, availability was limited to high end supermarkets and in very limited quantities at that. Last year they were still available at seafood counters in most high end supermarkets such as Wegmans® and Whole Foods®. This year, many stores (including our neighborhood Giant® did not even order them – no doubt due to cost and the resulting loss. Few customers are willing to pay $ 7.99/crab. Soft shell crabs are only available during a very narrow window of time and the price can change due to market conditions. That does not mean we no longer enjoy soft shell crabs! So where do I buy my soft shells when we have an urge to splurge? Prefer soft shell crabs already prepared, tempura battered or lightly breaded? Click HERE. It’s the only safe way to go. Stay away from them if they are shriveled up and dry looking. They’ve been in the case too long! Fresh soft shelled crabs should look glistening wet and still moving. Sounds unnerving but that is the only way to know they are truly fresh. Spare yourself the misery of eating bad seafood. Spoiled seafood can make you sick faster than just about any other food. Avoid all types of fish and shellfish if allergic to seafood. It pains me to think that the crabs which are not sold within a short window of time are tossed out. Wish they would let me know – I would have eaten them for breakfast, lunch and dinner! Handy Seafood Soft Shell Whale Crab, 4.25 Ounce — 18 per case. There was a time when the soft shelled crabs cost $2.99 to $3.99 each. This batch cost $7.99 each. Yes, that is expensive. I prepared a batch earlier this month by dipping them in batter and deep frying them – not in a deep fryer but in a deep pan filled with about 3/4 of an inch of oil. As good as the crabs were, the batter was overwhelming. It also reminded me of why I don’t deep fry anymore. After checking out a few recipes, I settled on this adaptation of a recipe found in a magazine. From now on, I will cook them this way. Place the crabs in a 9 inch round cake pan. My five crabs fit perfectly in the pan. Drizzle milk over them – not enough to drown them but in a quantity sufficient to have them partially submerged. After about 3o minutes on one side, I flipped them over so the other side could soak in milk for another 30 minutes. Apparently, the milk bath keeps them nice and moist while frying. Indeed it does! Meanwhile, in a freezer weight zip lock bag, I prepared a mixture of about 1 cup regular flour, 1/3 cup corn meal, about 2 teaspoons of freshly cracked pepper and 2 teaspoons of Old Bay® seasoning. I did not add any salt but you can opt to use salt instead of Old Bay®. I placed the crabs in the zip lock bag one at a time and shook just long enough to coat the entire surface evenly. As you remove each crab from the bag, shake off any excess flour coating. Place the crabs on a platter to dry for about 10 minutes. To a large, heavy bottom frying pan on medium high heat, I added a three to four tablespoons of high quality olive oil and a pat of butter (probably 1/2 tablespoon). I did not want the butter to burn too quickly. Be sure to have a large splatter screen handy. Soft shell crabs are notorious for popping and splashing drops of hot oil while frying. Some of the worst burns I’ve had while cooking were from “exploding” soft shell crabs! Fry about 2 minutes per side or until golden brown. Serve immediately with a little bowl full of Rémoulade sauce. Store bought is good – this one is our favorite. The sauce is spicy and salty enough to make up for not adding salt to the flour coating. Fry the crabs two at a time giving them plenty of space in the pan. You will need to add olive oil for each batch you fry. As you can tell from the pan in the slides below, there is not enough oil left in the pan to fry the remaining crabs. For the best pan fried soft shelled crab feast, buy them while they are still in season. I usually buy them small but crabs are available in several sizes including a jumbo “restaurant” size and the “whale” size. I’ve had a whale size soft shell crab sandwich at a dockside restaurant – they are humongous! 1 Flash Frozen Or Live!